A luxurious oil that improves skin barrier function to seal in moisture. •Formulated with Chia Seed Oil, containing 60% pure Omega-3s to nourish and rejuvenate dry skin. •A multi-purpose oil that is ideal for dry skin, hair and cuticles. So I can proudly now say that I've tried almost all of Dr Perricone's Super products, and each one is honestly better then the next. I was always a bit doubtful about the "Super" line, because it is meant for younger, more youthful skin, and it isn't as powerful as the original Perricone line-up, ( so not true) the Super line is a fun colorful array of products, each one has a yummy smell and does brilliant things for your skin. I wouldn't say it's any less powerful then the original line up, just a newer fresh line of skin care containing natural ingredients your body and face needs to look youthful and healthy. So when I was told I HAD to try the Super O-Mega Oil, I knew it was next on my Perricone bucket list. Dr Perricone has always recommend eating foods high in Omegas, such as salmon, anchovies and other fish, most of which I dislike. So my diet has been lacking O-mega Oil, which might be why my skin has been looking a little thirsty, dry and lifeless. Just the other day my dermatologist told me I needed a chemical peel to "freshen" up my skin. Ouch, burn. 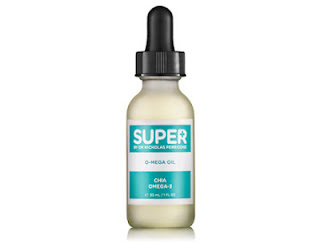 Without having to eat fish like anchovies, yuck, or sardines I can quench my skin's thirst with the Super O-Mega Oil. Similar to Josie Maran's oil, (without the extremely high price tag) this is an oil meant to moisturize in the best possible way. It can be used on your nails, hair and skin and won't cause a break out or make you feel greasy. I found a little goes a LONG way with the Super O-Mega Oil, and my favorite part is the delighful scent of gum drops. Yes, this oil smells like a gum drop! And when a beauty product smells like candy it goes up at least two notches in my book. I have yet to use it on my hair or cuticles, but it has done wonders for my face. I've been lacking moisturize around my cheeks and nose, and a couple drops a night of the O-Mega Oil, and the next day my skin has been repaired back to it's natural softness. It's also non comedogenic, , chia oil helps regulate sebum production which is also a major plus. 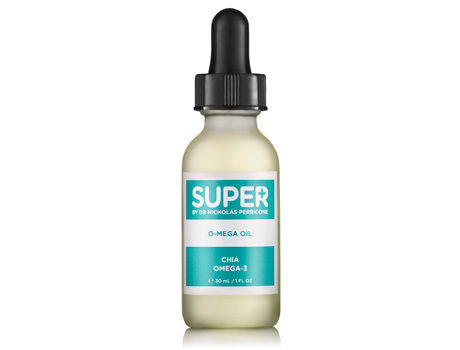 And although my skin is not prone to break outs, the Super O-Mega Oil will help keep my pores under control as well. The Super Perricone website, also has a fun new feature, where you can record your own product review right to their website. Love it? Hate it? Perricone wants to hear people's opinions, and I think this a great new way to hear what others think about a product before you purchase it. It's become a habit of mine to read product reviews before I purchase something, especially beauty products, so when a website has something like this, it's because they believe in what they are selling. This is why Perricone is one of my favorite companies, and the Super O-Mega Oil is another hit for me.